Photo by Lance Cheung / U.S. Department of Agriculture. As next June’s Rio+20 summit on sustainable development approaches, discussions about how to effectively establish a green economy are surging. But as a recent conference of the United Nations Institute for Social Development emphasized, the green economy is not simply about the economy and environment. Rather, it requires a deeper restructuring of economic and social processes including people’s relationships with food and agriculture. Debates on food safety, which arose at the end of the 1990s due to the controversies over bovine spongiform encephalopathy, avian flu and genetically modified crops, as well as health problems associated with modern eating habits (such as obesity), have propelled interest in healthy local food in both developed and developing countries. A study published earlier this year in the United Kingdom shows that, in addition to health benefits, the quest to improve the quality of school meals (led by the celebrity chef Jamie Oliver) has contributed to improving test scores and decreasing absenteeism. And a recent International Food Policy Research Institute review of food for education illustrates how securing adequate quantity and quality of food for school meals is vital to achieving education for all, because in many developing countries, the school meal is the main — if not the only — meal of the day for many schoolchildren. Good quality school food guarantees school attendance and good educational outcomes. The Home-grown School Feeding Programme is an international initiative led by the UN World Food Programme (WFP), and shows a unique institutional experiment in promoting a green economy by linking public sector food procurement to sustainable agriculture. WFP’s focus on promoting ‘home-grown’ elements in school meals is innovative because it intends to link people’s concerns about the quality of school meals and education to sustainable agricultural development. In particular, the programme aims to promote ‘localisation’ of food production, distribution and consumption, and significant empowerment of consumers (such as parents and teachers) and local farmers so that they can start to negotiate with local authorities to procure local produce for school meals. From an environmental sustainability perspective, localisation is also recommended given that it reduces food’s ecological footprint. Japan, for example, has been promoting localisation — known as chisan chishou (literally, local production and local consumption) — in its national school feeding program. This system has worked to connect schools to local farming or fishing communities, and it is intended to nurture children’s familiarity with local culture, food industries and the environment. Brazil is considered to have an exemplary home-grown school feeding programme. It has successfully rearranged public and private institutions in such a way as to empower social actors like consumers, farmers and public authorities at various levels to define their own terms of engagement to improve the quality of school meals. Initially, the national school feeding programme in Brazil was a highly centralized program. Starting in the 1950s, the central government procured food for schools, mostly non-perishable cereals and powdered milk. It stored the food in warehouses in state capitals from where it was distributed to interior areas. However, due to the precarious transportation and storage facilities at the time, even the non-perishable and processed foods often spoiled before they reached children. In 1997, decentralisation saw budgets for school meals transferred from the central government to municipal governments, enabling local authorities to procure food for public schools. In 2006, under President Lula da Silva’s Worker’s Party regime, which has kept close contact with landless and family-based small farmers’ movements, the National Food Security and Nutrition Programme started to promote the idea that secure access to a sufficient quantity of good quality food was a human right to be protected by the government. This idea was rapidly linked to the concept of “food sovereignty” underpinned by appreciation of local food culture and family-based agriculture. Then in 2009, a new law came into effect to fully implement the ‘home-grown’ school feeding by obliging every municipality in Brazil to spend at least 30% of its allocated budget to procure local produce directly from family farms. Since then, about half of the more than 5,500 municipalities in Brazil have their own designated School Feeding Committees, which consist of the municipal and state secretaries of education, town councillors, and representatives from local Parents and Teachers Associations. 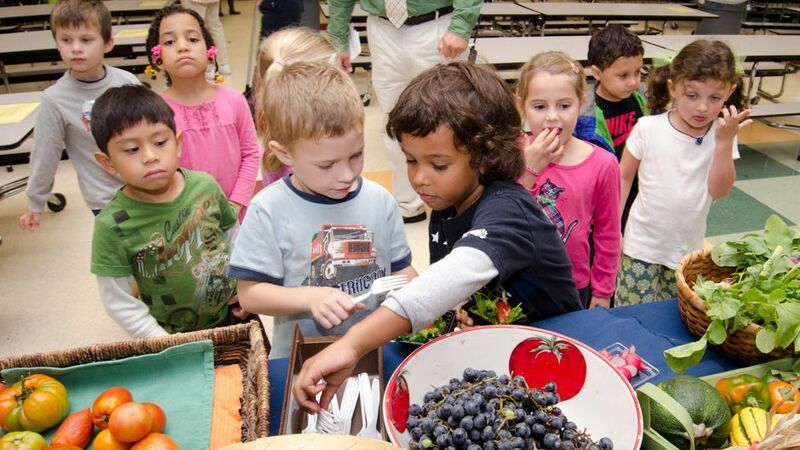 These school feeding committees are now taking the lead in local food procurement and ensuring school menus reflect the voices of local children and their parents. In relatively developed municipalities in the south and southeast of Brazil, various channels have been established to include locally procured fresh vegetables and fruits in the menus. For example, in 2008 in the municipality of Campinas in the state of São Paulo, the school feeding committee partnered with the municipality’s central wholesale market to provide 164,000 children from 500 schools with school meals using fresh vegetables, fruits and milk, which are procured from local farmers. Today, the municipal market employs 10 nutritionists who are responsible for helping schools to develop menus. In Brazil, outstanding localized school feeding practices are recognized annually by the government-backed programme known as Zero Hunger Action (Ação Fome Zero). Over 30 municipalities are nominated each year, providing incentives to improve the quality of school meals. This year, the municipality of Quixaba in the northeastern state of Paraiba, one of the poorest regions in Brazil, has been short-listed for the award, as its local committee started to use local produce procured from family-based small farms. Since many small farmers, especially those who had been recently given land as a result of agrarian reform, do not have access to infrastructure for effective commercialization of their produce, the school feeding programme provides an avenue to boost local agricultural development and help alleviate rural poverty. Localisation of Brazil’s national school feeding programme has led to a flexible form of national governance that connects local citizens, including producers and consumers, and various local organizations to municipalities and then to multiple national authorities. Rather than dictating top-down, one-size-fits-all policies from the capital Brasilia, the central government today acts as a duty-bearer who monitors the transparency of local school feeding committees’ financial operations and compliance with federal guidelines. For their parts, the local committees can always demand that the central government improve basic infrastructure and extension services for family-based small-scale producers and distributors to be able to regularly supply quality foods. Perhaps as a first step to ensuring that a green economy takes into account social equity, we need to start with the notion, taking shape in Brazil and other countries, that we all have the right to fair and transparent governance that guarantees good quality food. Home-grown food in schools for a green economy by Kei Otsuki is licensed under a Creative Commons Attribution-NoDerivs 3.0 Unported License.